Holy moley! You’ll be green with envy if you don’t get to participate in today’s food holiday. 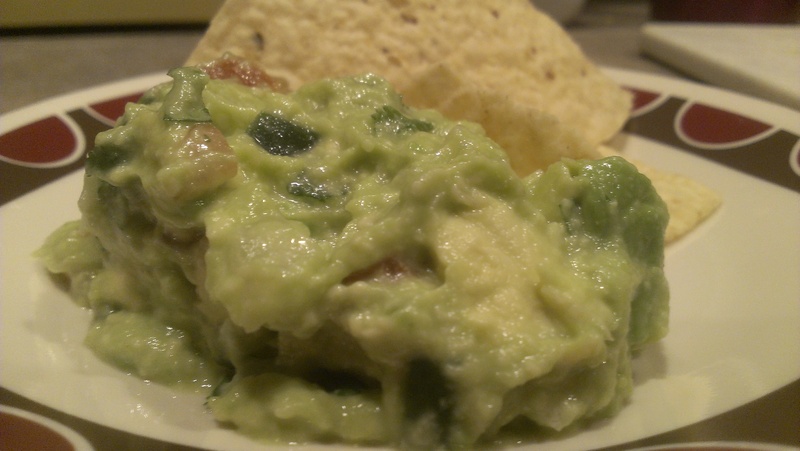 November 14 is National Guacamole Day! It’s also National Pickle Day (so the “green with envy” joke works either way). I love pickles, but we already celebrated them with the oddly-named National Snack A Pickle Time back on September 13, so today we’re giving guacamole its due. (Interestingly, according to some sources, there was also another guacamole holiday right around the same time – September 16 – but we celebrated Cinnamon Raisin bread that day). Guacamole was invented by the Aztecs back in the 15th century when some klutz stepped on a ripe avocado. That story may not appear in history books, but c’mon, how else could it possibly have happened?! The Aztecs called their avocado sauce, which they mixed with onions and tomatoes, ahuaca-mulli (“avocado mixture”). You’re going to have a ball with this, because it gets better: the word “avocado” is derived from the ancient Nahuatl word for “testicles.” Yummy. Spaniards were enamored with the dish and brought avocados back to Spain, but they didn’t grow very well in Europe, so they remained a treat for people traveling to the Americas. The English made an avocado paste they called “Midshipman’s butter” and spread on their hardtack to give it flavor (only this being the English, it’s flavour). The majority of American avocados are grown in California, and an estimated 30 million pounds of guacamole is consumed on two particular days: Super Bowl Sunday and Cinco de Mayo. Guacamole comes in many forms: it can be thick and chunky, or smooth and almost soupy. Typical ingredients include onions, serrano and/or jalapeno peppers, cilantro, lime, and tomatoes. I am particularly proud of my homemade guacamole. It’s simple to make and delicious! I adapted the recipe from that found in a local Mexican restaurant, only mine tends to be smoother. I take two avocadoes, one tomato, half an onion, 1 serrano pepper, a handful of cilantro, a tablespoon of jalapeno juice, lime juice, and kosher salt to taste. Mash/mix/stir them all together, and let the flavors blend for 1/2 an hour in the fridge. That’s exactly what we did tonight! So, so good. Today’s one hell of a good day if you happen to be a fan of hard boiled eggs. November 2 is National Deviled Egg Day! Deviled eggs consist of hard-boiled eggs that have been split in half and filled with a mixture of egg yolk and other ingredients, typically mayonnaise and mustard (but never Miracle Whip, unless you’re my mom – blech). There are many other additions that can be mixed in, ranging from pickle relish and worcestershire sauce to onion, capers, and paprika. The “deviled” in the name refers to the spices that are added to the mixture. Deviled eggs date back to ancient Rome. When they weren’t busy feeding gladiators to the lions, the Romans domesticated fowl, and began making egg dishes of all sorts. Boiled eggs served with spicy sauces poured on top were the precursor to modern deviled eggs. A recipe from a 15th century Italian cookbook says, “Make fresh eggs hard by cooking for a long time. Then, when the shells are removed, cut the eggs through the middle so that the white is not damaged. When the yolks are removed, pound part with raisins and good cheese, some fresh and some aged. Reserve part to color the mixture, and also add a little finely cut parsley, marjoram, and mint. Some put in two or more egg whites with spices. When the whites of the eggs have been stuffed with this mixture and closed, fry them over slow fire in oil. When they have been fried, add a sauce made from the rest of the egg yolks pounded with raisins and moistened with verjuice and must. Put in ginger, cloves, and cinnamon and heat them a little while with the eggs themselves. This has more harm than good in it.” I’m a little unclear what “verjuice” and “must” are, let alone why anybody would want to follow a recipe that boasts “more harm than good” right there in the instructions, but who am I to judge life in 15th century Italy? Tara happens to be renowned for her deviled eggs. Renowned within her immediate family, anyway. We actually made them earlier this year to celebrate National Egg Day. Oops. (We didn’t realize there was a holiday dedicated specifically to deviled eggs later in the year). 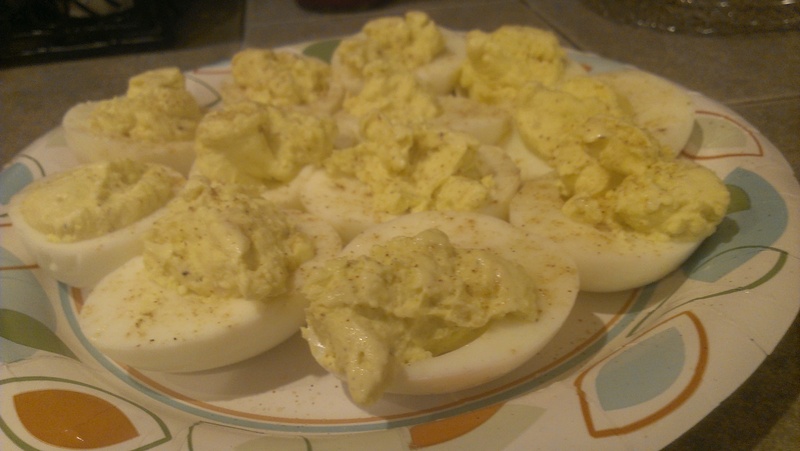 Tara gave step-by-step directions on making her deviled eggs in that post, so click on the link if you’d like the recipe. They’re so good, we enjoyed them just as much in November as we did back in June! You’ll have to come out of your shell and display bravery in order to enjoy today’s food holiday. May 24 is National Escargot Day! Escargot, in case you aren’t aware, is the French word for snails. Land snails, to be exact. They are considered a delicacy in France, and have been a staple of man’s diet for thousands of years. Archaeological digs have uncovered prehistoric caves filled with snail shells, indicating that early man enjoyed dining on the slimy little creatures. Gasp! What Neanderthals! Even when hunting and gathering expanded to include fish, game, and Big Macs, some cultures continued to enjoy snails as part of their cuisine, particularly Greeks and Romans, who considered them not just sustenance, but a delicacy. Kind of like the way we view lobster and caviar today. There are more than 100 varieties of edible snail worldwide, though two are typically used in the preparation of escargot: Helix Aspersa (or “Petit-Gris”) and Helix Pomatia (“Burgundy snail”). In France, snails are so popular they’ve got their own hunting season. Not all types are edible, though. Some taste unpleasant, while others are poisonous. Snails tend to take on the flavor of whatever they have eaten recently, and can actually become poisonous if they have eaten a poisonous plant, so they are typically “purged” (forced to undergo fasting) for 5-6 days before cooking. They are then removed from their shells, cooked with garlic, butter, and wine, and often placed back into the shells for serving, along with the fragrant cooking sauce and butter. All of this might turn your stomach, but I have actually tried escargot before. In fact, I consider myself a big fan. During my very first trip to Portland in the early 1990s, I tried escargot at a seafood restaurant, and loved it. Tara, naturally, was less enthusiastic about eating snails. I wanted to make my own, but very few local supermarkets carry snails, it turns out. We tried a bunch of different places, including some European and Asian markets, but came up empty. 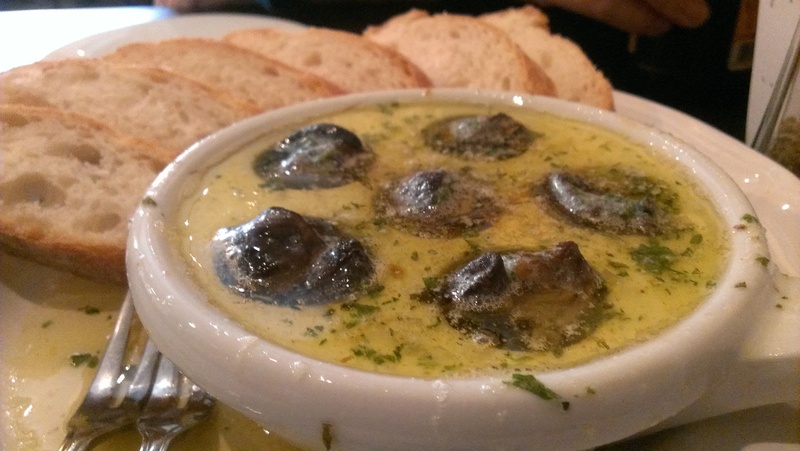 So we turned to Yelp, and found some suggestions for escargot in Portland. What the heck, it was Friday night – we decided to go ahead and make an evening of it. So we headed to the Hawthorne District to check out Chez Machin, a French creperie that looked promising (and promised escargot). And, they delivered! Now I have to give props to Tara. It is well documented that she is a picky eater, and that has proven to be the case many times during this food challenge. But sometimes she surprises me, and tonight was one of those times. Because she ended up liking the snails. Go figure! (They were pretty tasty, and the garlic butter made a great sauce for dipping that awesome French bread in, too). Much like fruitcake and Rodney Dangerfield, the food we are honoring today gets no respect. 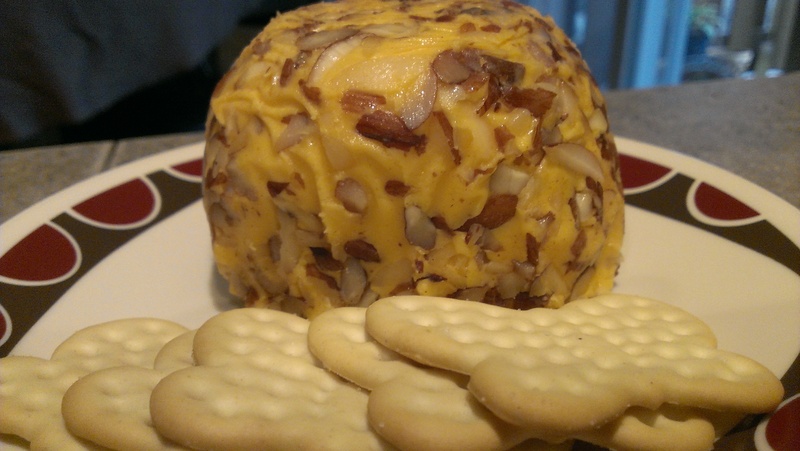 April 17 is National Cheeseball Day! This kitschy party favorite has gotten a bad rap for years. New York Times food writer Amanda Hesser once wrote, “Cheese balls tend to be associated with shag rugs and tinsel, symbols of the middle-class middlebrow.” But wait. I happen to be a fan of all things ’70s – including shag rugs and tinsel! In fact, I received a box of tinsel as a Christmas gift last year, after complaining that I could no longer find it in stores. (Thanks, future mother-in-law!). Which probably explains why I was looking forward to celebrating the cheeseball. Nobody knows its exact origins, but Virginia Safford’s 1944 cookbook Food of my Friends contains the first known recipe for a cheeseball. Typically made with a blend of cream cheese and another softened cheese, cheeseballs are popular party dips that, over the years, have fallen out of favor with the American public. This article has some great information as to why, and the explanation is right there in the opening paragraph: cheeseballs are viewed as “an orange softball filled with garish industrial cheeses, smacking of an untraceable sweetness, and coated with stale, often soggy, nuts.” But they don’t have to be this way! Recipes for gourmet versions are abundant. Even Martha freakin’ Stewart has come up with ways to class up the lowly cheeseball. So get on the bandwagon, folks! Let’s bring cheeseballs back into vogue! Tara and I bought one from WinCo. Kaukauna brand. It was…well, it was a cheeseball. Maybe there’s a reason these things receive so much derision. It made an “okay” appetizer for dinner, anyway.